CHICAGO – Under the theme “Imagine Justice For All in 2009” the National Alliance Against Racist and Political Repression (NAARPR) held its 36th anniversary and annual Human Rights Awards benefit here April 18. The event was held at the Lutheran School of Theology on the city’s south side in the Hyde Park area. Dr. Barbara Ransby, a professor in the African American Studies Department at the University of Illinois at Chicago, emceed the event. 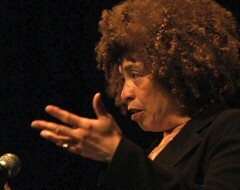 Legendary African American activist Angela Davis, a civil rights leader against the racist U.S. prison system and staunch advocate of ending the death penalty, was the program’s keynote speaker. Davis talked about the prison industrial complex and the role President Thomas Jefferson played in constructing the first penitentiary in Virginia. “Penitentiaries were considered at that time the solution to barbaric forms of punishment,” she said. Founders of the prison system felt correction facilities were an outlet where people could reflect on their crimes, develop a relationship with God and become new, changed and reformed citizens in democratic life, said Davis. “It’s obvious those hopes were not truly reflected,” noted Davis. “Instead we were given the institutions of prisons as an alternative to death and capital punishment,” she said. Today the fight against the prison system is the same fight abolitionist’s fought for against slavery 200 years ago, said Davis. “And there is reason why we still have the prison industrial complex and its called racism,” she added. Davis said slaves would receive the death penalty for 71 different counts compared to one (murder) for whites. “Today many whites are also victims of the racist reality of capital punishment,” said Davis. She noted that one-out-of 33 U.S. adults are under the direct control of the criminal justice system. Davis acknowledged that President Obama identifies with Black freedom struggles, and that rightfully excites many activists. She said that legacy of Black radicalism has always been a struggle in some form against the state dating back to slavery. “So what happens when you have a Black person at the head of that state?” she asked. “It’s almost a contradiction although we have to recognize the new terrain,” said Davis. Davis said people cannot sit back and think Obama is going to do all the work. Those who voted for him have to play an important role, especially young people, she said. “As much as we are told today that racism has receded and that Obama’s election was the last major blow to the racial barrier, that simply isn’t true,” said Davis. “We cannot pretend to talk about racism today like it was back the 1950s or 1960s,” she said. “The institutions of racism have very long memories and even Blacks and Latinos continue to practice various forms of prejudice,” said Davis. “The question of race is so essential to the history of this country,” she noted. “And working against the prison industrial complex and the death penalty will help us to understand the markings and history of U.S. slavery,” she added. “The fight for justice today is indivisible. Justice for one always means justice for all and it transcends all national and ethnic groups,” said Davis. The issue of decriminalizing drugs and the question of violent acts especially when it comes to sentencing people to prison deserves more attention and analysis, noted Davis. “If we are ever going to abolish the prison industrial complex then we need to begin to abolish the social and racial injustices of our educational system,” said Davis. Soon after Davis became a tenured professor in the History of Consciousness Department at the University of California, Santa Cruz. In 1994 she was appointed Presidential Chair in African American and Feminist Studies at the University of California. 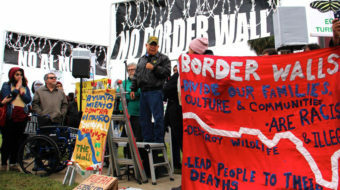 She has since retired from the University of California, Santa Cruz but continues to teach classes, working with graduate students and helping to build an activist presence on campus. Human Rights awards were granted to honorees at the event whose work includes ending the death penalty, overturning wrongful convictions, the fight against racism and efforts to help victims of the prison industrial complex. The honorees included: Patricia Hill, executive director of the African American Police League; Jane Raley, senior staff attorney with the Northwestern Law School; Judith Stuart, an anti-prison activist, Rev. Jeremiah A. Wright, retired Pastor with the Trinity United Church of Christ; and Karen Yarbrough, Illinois state representative. The NAARPR works to fundamentally change the prison industrial complex including the mass executions of those on death row throughout the U.S. Fifty-three prisoners were executed in 12 states in 2006. There are more than 3,500 people on death row in the U.S., all of them poor and most of them African American or Latino, according to the NAARPR. Most countries have abolished the death penalty in law or practice, NAARPR leaders charge. The NAARPR has active chapters in Nevada, Kentucky and Illinois. For more information go to: www.naarpr.org.